Atradius Collections comprises an experienced team of debt collections specialists and is available to you, regardless of whether you have Credit Insurance with us or not. If you do have an Atradius Credit Insurance Policy, Collections is automatically available to you at no extra charge. What can Atradius Collections do for your business? Nearly all companies will experience a bad debt and may need support in recovering money owed at some time. Our bespoke worldwide debt collection service will support you in the way that is most appropriate for your situation, from simple communications through to legal action. As debt collections specialists, we know how to exert the right level of pressure to maximise revenue collection. We aim to recover your debt amicably without the need for expensive litigation and find that a proactive and sensitive approach can often yield the best results. For example, a payment plan for a customer experiencing cashflow problems may result in complete settlement of the debt and the retention of a strong working relationship with you. With the benefit of our worldwide IT infrastructure, the Atradius Collections network is the most integrated in the industry. No matter where you or your debtors are located in the world, we can support your collection of outstanding invoices. How does Atradius Debt Collections work? 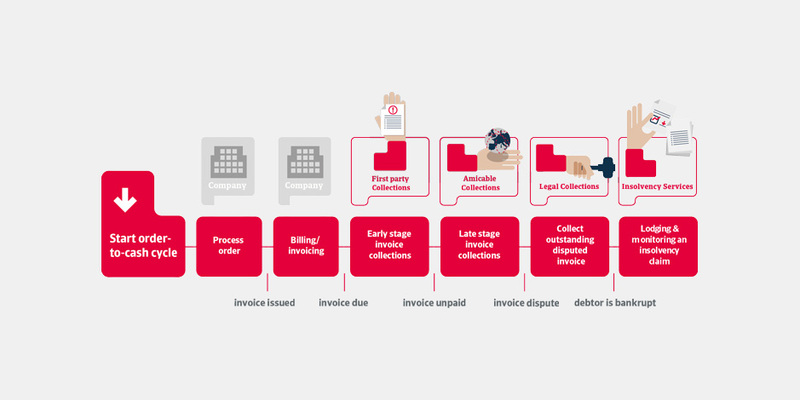 Atradius Collections begins work the moment you notify that an invoice is due and has not been paid. We contact your debtor on your behalf, in their language with a representative that is located close to the region in which they are based. With your approval, we negotiate with your debtor to find the speediest solution for revenue collection to settle the debt. Any communication with your debtor is shared with you. We’re committed to transparency in our relationship with you and, therefore, work closely with you sharing knowledge and information to work smarter and achieve the best results for your business. If you’re an Atradius Credit Insurance policy-holder, you may manage Collections through Atradius Atrium. As a non-policy holder, you may manage your cases through our dedicated online system, Collect@Net. For further information about how we can help with your debt collection requirements, get in touch to discuss your needs and to learn more how we can support you. Our dedicated Atradius Collections website provides additional information about the work of our Debt Collections team. It includes access to customer testimonials and regular publications with tips and examples of ways to manage and reduce unpaid invoices.